The latest edition of the Samsung Family Hub refrigerator allows families to take control of their kitchen, with tools that not only streamline cooking but also facilitates food management, enables communication and even provides multiple options for entertainment. As an example, with the many Online Shopping Apps, Family Hub owners can order food to be delivered directly to their home, straight from the appliance’s large touch-screen display. 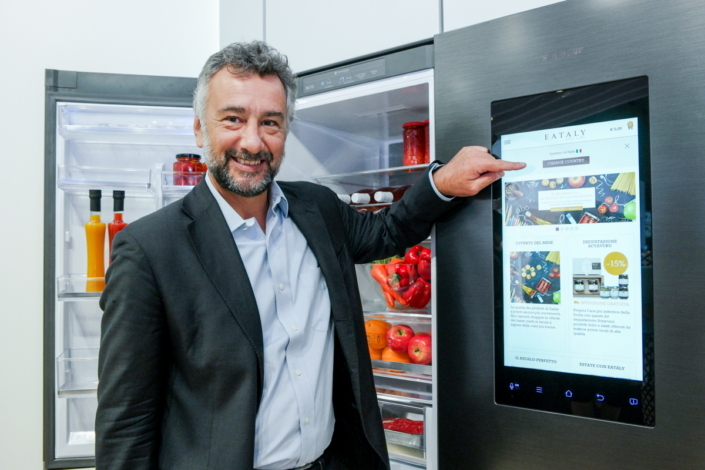 To create the best user experience possible, Samsung partnered with the top online grocery shopping services across Europe, including EATALY, the world’s leading provider of premium Italian foods. 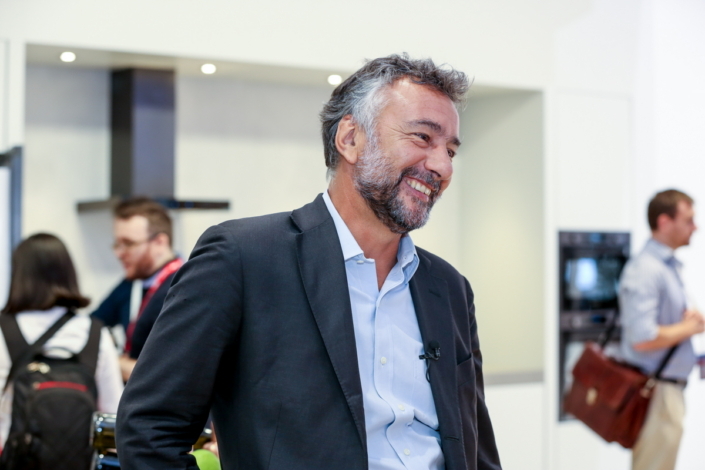 At IFA 2016, Andrea Casalini, CEO of EATALY.net; provided his insights on the value he hopes the collaboration with Samsung will bring to users. Q. What’s the concept of EATALY and how to do you strive to deliver that concept? EATALY is a very interesting concept that goes back to the traditional and cultural roots of Italian food and wine. We aim to not only to deliver a product, but to combine a little bit of everything into a single location where people can learn and understand the traditions and history of Italian food, all the while having a good time with loved ones. At EATALY, you can taste excellent cuisine, sample good wine sourced from artisanal producers or take a cooking class. Our objective is to deliver this consistently all over the world. Q. EATALY currently delivers to over 25 countries around the globe, and is continuously growing. What do you think has made the company so successful? Personally, I think it’s our authenticity. With EATALY, people can have a real Italian experience. But it isn’t just about Italian products. It’s more about the culture of cuisine and the passion for food. People seem to be really happy to experience this in our stores all around the world. Another reason behind the success of the company is the products that we offer. The items that we sell at EATALY can’t easily be found at other stores. So it’s very special in that sense. Q. Now people can purchase products from EATALY directly from the Family Hub refrigerator. What made you want to partner with Samsung on this device? Technology is changing how we live, including how we shop for groceries. EATALY recognizes this, and, as a result, has been working to build our e-commerce platform for the past few years. We are always looking for new ways to make the experience more convenient and seamless for our customers. I truly believe that the refrigerator is the core of the family at home. The Family Hub refrigerator, which allows people to purchase groceries right from their kitchen, is a perfect example of this. So, collaborating with Samsung to give users more convenient access to EATALY products was a no-brainer for us. Q. As someone well acquainted with high quality food, what Family Hub features do you find most useful? In my home, it’s all about delivering the best quality food. If you want to serve really good food, then it has to be sourced properly and maintained in the very best way. I personally like the Family Hub’s Chef Zone, which is ideal for managing temperature-sensitive proteins. The refrigerator’s three inner-view cameras also help to ensure that ingredients are fresh, another important factor of high quality food. Q. The Family Hub refrigerator is one that aims to better connect families. In your opinion, what is it about food that brings people—especially families—together? First of all, food is something that is a natural and necessary part of life. It all goes back to our primary needs. But, it also has the ability to create a memorable experience. Nowadays, especially, our lives are incredibly hectic. So, the moment that family comes together to enjoy a meal and connect with one another is really special. This isn’t just an Italian tradition, it rings true in all parts of the world.